Because of my on-going heart failure and the issues that my meds and high-potassium foods are doing to my body, it recommended by my dietician to start following the Mediterranean lifestyle when it comes to eating. Like I had mentioned earlier, I am not a diet person. I have a hard time calling this a “diet” only because I see diets as not allowing me to eat certain things. But one thing I love about the Mediterranean diet is that nothing is off-limits. Just everything in moderation. One thing I was recommended to eat more of is fish. Thankfully I LOVE fish, so this wasn’t hard news to hear! When Dan and I were in the Florida Keys a few years ago, one thing I became obsessed with are fish tacos. I’ve had a hard time finding the right recipe for fish tacos that was easy and that I liked. Some recipes are pretty complicated, but from the New York Times, I found a recipe that used (almost) all ingredients I had in the house – minus the jalapeno, chipotle pepper, and corn tortillas. Sometimes recipes use obscure ingredients that are expensive and are a one-time use type ingredient. This recipe though, uses pretty much all items you’d have in the house, with the exception of maybe the cabbage if you don’t normally eat it. But have no fear, they still tasted absolutely AMAZING! Because I have to count my carbs, I probably shouldn’t have had two, but I couldn’t resist! 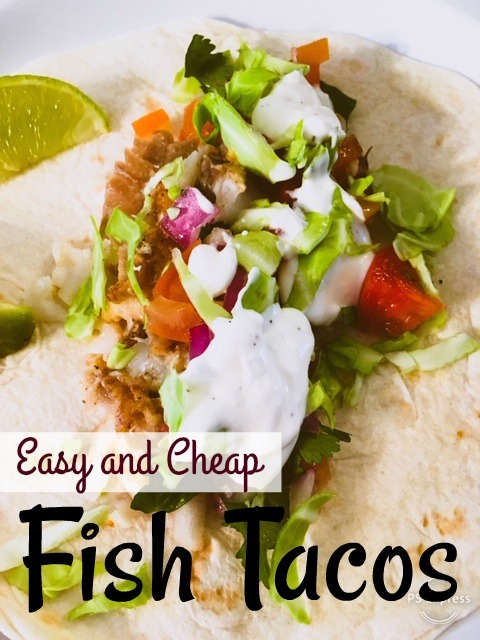 So, if you like your fish tacos, you need to give this easy and cheap recipe a try! In a medium bowl, combine the tomatoes, onion, garlic, cilantro and jalapeño (if using). In a small bowl, whisk the mayonnaise and sour cream until combined. Season to taste with the halved lime, salt, pepper and chipotle (if using). In a medium bowl, mix together the flour, chili powder and 1 1/2 teaspoons each of kosher salt and black pepper. Pour the milk into another medium bowl, and place the fish into it. Pour 1/4 cup of the peanut oil into a 12-inch frying pan and place over medium-high heat until it shimmers and is about to smoke. Remove the fish pieces from the milk bath and dredge them lightly through the flour mixture, shaking to remove excess. Add the butter to the pan. Place some fish pieces in the oil, without crowding them, and cook until deep golden brown on one side, 3 to 4 minutes. Turn carefully and cook for 1 minute more. Remove to a warmed, paper-towel-lined plate and sprinkle with salt. Repeat with the remaining fish. Meanwhile, lightly grease a skillet with a drizzle of oil and set over medium heat. Heat the tortillas, one or two at a time, until they are soft and hot. Keep them warm, wrapped in a dish towel. Fill each tortilla with 3 pieces of fish, browned side up, followed by tomato salsa and a pinch of cabbage. Drizzle with the cream sauce. Serve 2 to 3 tacos per person, with lime wedges and hot sauce on the side. That sounds so good!! I am going to have to try those!!! I first had them in Hawaii and then if Florida!! Yum yum. I have had them at Beechwood Grill but a little pricey and you three which is way to much for me!!! I will try this!! Hi Betty! I’ve also had them at restaurants and I truly love this recipe! It’s not hard to make, just all homemade, which makes them taste even better! They definitely were not pricey to make. Let me know if you try them!